Backwards Engineering the entire From Russia with Love, Trump Imbroglio. Is the Hunting for Digital Dirt Lawful in any way? As more and more Russian pieces become exposed, it looks like Digital Dirt is going to hit the fan when this is all done. But DailyPUMA wonders, is Digital Dirt protected under the law? For instance, if it is proven that Trump, or his campaign, or friends of his campaign were indeed hunting for and paying for "digital dirt" on the DNC and Hillary Clinton, DailyPUMA wonders if it matters whether or not the digital dirt was simply exposing digital dirt that had already been created by the DNC or Hillary Clinton, versus actually creating new or false digital dirt. Does the exposing of truthful digital dirt mean illegality? Certainly creating fraudulent digital dirt would be illegal, but what about truthful digital dirt? Does one's right to secrecy end when one digitizes the dirt themselves? If so, then is it possible that at the end of a very long investigation, the wiggle room the Trump team will use to get out of their very big mess is to simply state, "We did everything we were accused of, but it was all done in search of digital dirt, dirt that already existed and that had been created by the very people now claiming they were hurt by their own digital dirt being exposed to the world". If defining the right to use Digital Dirt is the end game, what are the parameters that need to be considered? If Person A says says to Person B in the privacy of their own residence that they think person C smells bad, drinks too much, and needs to take more showers, and person A and B never mention the conversation ever again, then it can never be uncovered by the digital dirt diggers. But if Person A digitally sends that same message to just one other person, perhaps even encrypted, and then Russian hackers figure out how to un encrypt that message, just what law has been broken? Sure hacking into anyone's email system would obviously be bad, but if the digital information culled by the hackers is authentic, perhaps that does not rise to the level of actual theft of a digital document since the original digital document remains in place. Think of it as using a powerful microphone outside of a building that can pick up conversations within the building. Or think of it as rummaging through someone's garbage, which is legal. A digital document can simply be copied, leaving the original as is. If a Hacker in anyone altered existing digital content, or deleted anything, then that action is certainly illegal. 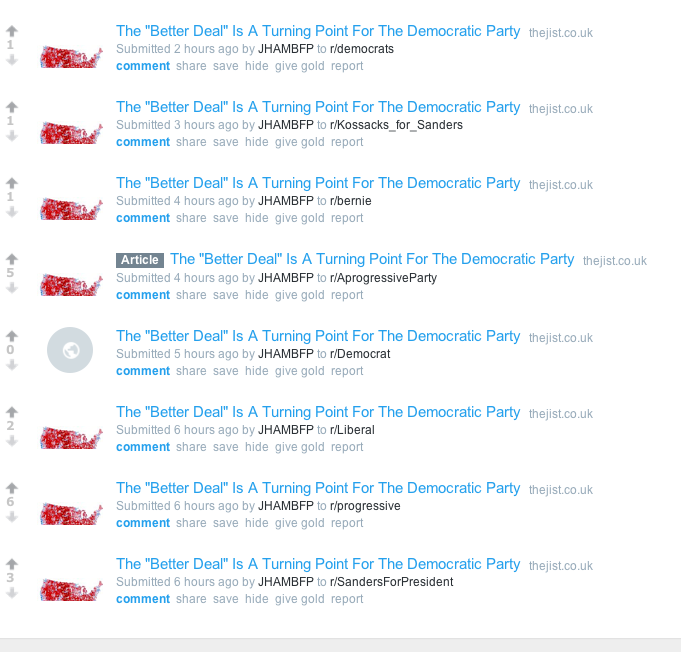 DailyPUMA thinks it is possible that as long as Team Trump never encouraged anyone or paid anyone to create false digital dirt, but only to search for authentic digital dirt that came from the DNC or Hillary Clinton, that Team Trump has not actually committed an act of treason or significant crime. If damaging intel only existed on paper, and the intel was only presented at an in person meeting, then breaking into the physical facility and stealing or copying those documents WOULD be an act of treason. But copying and not altering digital dirt is just not the same thing as actually stealing or altering the original since no person is actually invading another's persons real space. The simple rule is this, from your mind to your fingertips to your pen, pencil, or typewriter, to your own piece of paper, you own that intellectual property and any copying of that data by another without the writer's permission is breaking the law. But the moment that same data is then transmitted via email or cell phone, (not sure about fax or using a copy machine), the hacking of that intel is not treason. However, this all dovetails into another issue. By hiding his own income tax filings, Donald Trump may be hiding his business relationships with free speech groups such as The Globe, National Enquirer, or The New York Post. It is possible that Donald Trump or his team may have used the hacked material they solicited for to create false or misleading news innuendo, and that should be considered treasonous and not protected by free speech rights. Using hacked material to create fake news to damage the DNC and Hillary Clinton is probably a treasonous offense, but no one is looking at the Weekly Mags that trashed Hillary Clinton with all kinds of innuendo because they presume its a free speech issue. Free speech should end when the causation of the free speech has come from hacked material inspired by meetings with a political operative, otherwise free speech media becomes a great motivator for hacking, and also rewards hacking. Well why hack then if the hacked material cannot be used by news organizations? Hacking still gives insight into the opposition's motives, but when the hacking is used to politically benefit the initiators of the hacking by publicly exposing the hacked material, that most likely is once again crossing the treason line if the hacking was inspired by the Trump team. Put another way, hacked material that was inspired by political operatives to he hacked and distributed to the media is treason, hacked material for internal use only is probably not treason, hacked material by a third party who never had an interaction with anyone else probably is not treason. Donald Trump's Secret Medical Episode, was it Botox, Bells Palsey, a TIA (mini Stroke), or maybe a dental procedure, and is this a Medical cover up until after the Senate Votes on HealthCare today? DailyPUMA, and probaby others have noticed Donald Trump cannot smile on the right side of his face. DailyPUMA would like to know what his medical condition and prognosis was and what it cost, or is that too none of our business? Is this a medical scare cover-up until after the Senate Healthcare Vote is taken? If the right side of Hillary Clinton's face was having difficulty smiling, and less able to smile then the left side of the face, Fox News and the Crazy Conservative Media would be DEMANDING to know what Hillary Clinton was hiding. Donald Trump has suddenly come out in favor of a solar energy wall, something that DailyPUMA suggested on June 21st, 2017, and then repeated the Solar Energy Wall idea on July 05, 2017. DailyPUMA's Solar Energy Wall idea went uncredited by Mr. Trump, but it's possible someone other than Trump could have read DailyPUMA and then ran with the solar energy wall idea and pitched it to Mr. Trump's team. Progressives will make fun of the solar energy wall idea, but it is a compromise that basically will propel the U.S. forward in the Solar Energy race and maybe educate Mr. Trump on the merits of renewable energy. Rather than attempt to force Mexico to pay for a conventional brick and mortar, or steel wall, the U.S. could actually offer Mexico 10% or 15% of the energy produced by the solar energy wall as a sign of friendship and respect. The Solar Energy wall does not have to be as efficient as a solar energy plant, it just has to produce enough energy to eventually pay for itself since a conventional wall will just be an expense. As for a Solar Energy wall being easier to disassemble, damage, or even steal the panels, two things to consider. Embedding GPS markers in the panels could prove a strong deterrent to stealing the solar energy wall panels, and because the wall will be easier to damage than a conventional wall, anyone attempting to scale or damage the wall will be hit with some type of financial liability as well, something less likely to happen with a more conventional wall. 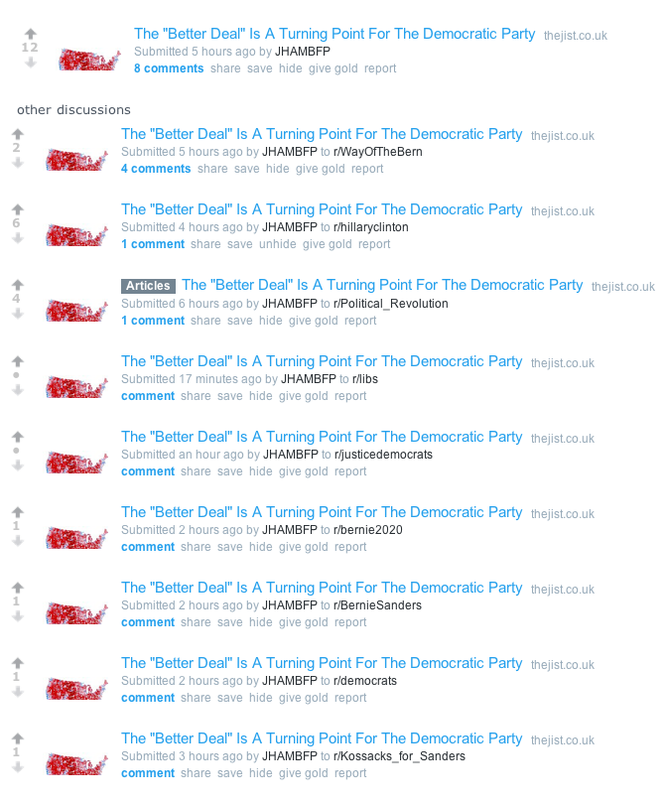 Bernie Sanders supporter Trolls over a Dozen, make that 15 Reddit Forums (and climbing?) …with the same Trashy Article that Concern Trolls the Democrat Party while praising Bernie Sanders. 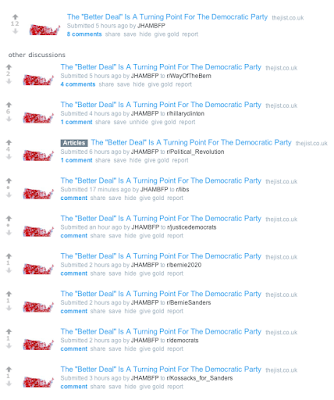 Click Each Image to Enlarge to see all the Reddit Forums this Pro Sanders Article has been spammed to, the numbers seems to be growing by the hour. 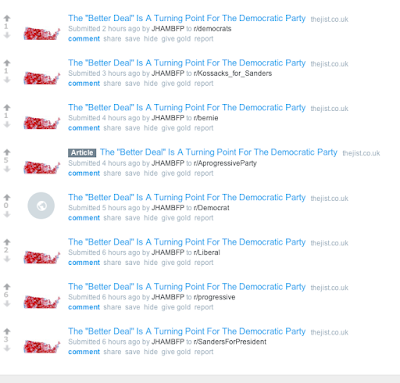 Meanwhile DailyPUMA was banned from posting on the most active Hillary Clinton forum on Reddit by alleged pro Hillary Clinton Moderator, who of course has left the Pro Sanders article up on the Hillary Clinton site. A Trump / Putin / Russia Timeline. I presume a lot of work went into the article about the Trump / Putin Timeline. Check it out. Why didn't the FBI investigate every Trump visit to Russia over the past 20 years during the 2016 Presidential Race? Why did the FBI not investigate Trump's income tax returns to see if he co mingled his business interests to attack Hillary Clinton? What if Donald Trump's business ventures included some type of quid pro quo with the National Enquirer, Globe Weekly, or the New York Post? What if his media business ventures were either mentioned in his Income Tax filings, or were not mentioned and hidden? Shouldn't the FBI have investigated these issues? We've all seen the almost constant tabloid journalism attacks against Hillary Clinton during and after the 2016 campaign. Some of the Tabloid cover page articles almost feel like Donald Trump composed them himself. Lets not forget Trump has been accused of faking being another person and then doing an interview as the alternative persona, who in turn of course praised Trump. Trump should have been investigated by the FBI in 2016 as to whether or not his trips to Russia were for political reasons, and if Trump has any ties to the National Enquirer, the Globe Weekly, or the New York Post. Was there a quid pro quo between Republican James Comey and Republican Donald Trump during the 2016 Presidential Campaign in which Comey would not investigate Trump? It is imperative that Trump's tax returns going back 20 years be made public, and then investigated for thoroughness and accuracy. It is also imperative that Donald Trump's visits to Russia, and possibly visits from Russian's counterparts to Trump at his various residences, also be investigated, for the first time. The problem with using a two year old's "mine" meme when it comes to Republican Politicians in charge of the 2017 Congress and the Presidency. DailyPUMA has a simple question to ask. If Donald Trump is going to power through and evict 5 to 10 million people in America for not being official citizens, isn't that going to bring the cost of MediCAID down? In California, there are over 500,000 undocumented MediCAL enrollees out of 11 million total MediCAL enrollees, or 4.5% of MediCAL enrollees in California are undocumented. If Donald Trump succeeds in reducing the ranks of undocumented in the U.S., then aren't MediCAID costs going to dip as well? Why would Trump want a cut in MediCAID when a reduction in MediCAID enrollment will achieve the same effect? DailyPUMA thinks it may be possible to build a Solar Energy Border out of Solar Energy Panels at a cheaper overall cost then conventional brick and mortar, and that the solar energy created could actually be shared with Mexico. But once again, Trump is so fixated with a brick and mortar economy that the concept of building a wall that pays for itself and helps make the US more energy efficient while possibly reducing the flow of drugs and people into the U.S. has probably not even been considered. DailyPUMA would like to see the U.S. offer North Korea "Major Non-NATO Ally" status in exchange for halting their nuclear research and proliferation. Yes, "MNNA" is REAL. Offer Kim Jong Un an opportunity to speak at the NATO conferences and to interact with NATO leaders regarding economic opportunities. Instead, it seems like the best that Trump can do is a "This is going to hurt me more than it is you" meme as he prepares to drop a nuke on North Korea, or, waits until North Korea has attacked someone and caused major damage, and then drops a nuke on North Korea. The problem as DailyPUMA sees it is Donald Trump takes too much of a "Mine" approach towards his causes. Regarding the Affordable Care Act, which was voted in by a MAJORITY of Americans in 2010 and then revalidated again in the 2012 Presidential Election, Trump instead has taken the position that Republicans have been trying to overturn ObamaCARE for seven years. Isn't trying to overturn the ACA as soon as it was voted in by a majority of the people, a form of treason? Instead of seven years of unethical and treasonous battles against the ACA, it's really been just six months, so why are the Republicans exaggerating and calling it a seven years of struggle to overturn the ACA when the ACA had the popular vote for the first several years, and probably still does…oh wait, maybe because the ACA has the majority vote is why the Republicans feel it is ok to have a seven year struggle against its repeal. Sounds treasonous to DailyPUMA to openly or privately state someone has been trying to kill a bill from the moment it was voted in. When Donald Trump and Mitch McConnell openly admit to a seven year battle to repeal ObamaCare, they are in treasonous waters in DailyPUMA's opinion. The ACA repeal sounds like the "Mine, Mine, Mine" meme at work, and if the Republicans don't succeed, they will simply hasten its demise. Donald Trump has yet to create a talking point on any of his issues that has garnered over 50% of the voting public, and that is why the "Mine, Mine, Mine" mentality is not working. What Donald Trump really means when he says "Make America Great Again". When Donald Trump says "Make America Great, Again", DailyPUMA believes Trump really means "Make America Simple, Again". The Climate Accords seems to expose that what Trump clamors for and demands is simplicity. Rather than keep improving solar and wind technology, which Trump apparently considers too complicated, lets just harvest all of our non renewable energies at a faster pace. The Paris Accords in Trump's mind were about reducing energy simplicity in the short term even though in the long term it would mean more efficiency, hence, more for all. Investments become easier to make when it comes to knowing what simple energy company to invest in, but when it comes to non-renewable energy, there is no simplicity. Trump's has even had his own Quixotic moments literally battling windmills that were obstructing the distant view of a golf course he was vested in. Although it can also be argued that rich Democrats don't want their view obstructed by windmills either. Trump might actually garner a majority of Americans to approve his wall if Trump championed a wall made out of solar energy panels. But that might prove too complicated and would compete with his agenda of simple, old school energy. Donald Trump seems to adore simplicity. Be it getting two scoops of ice cream on his pie while his guests get just one, or using a Golf Cart in Sicily while six other leaders at a G-7 conference (who then had to wait for Trump to catch up for a photo op) walked, Trump seems to like the simpler things. Simplicity can have its virtue and many times does, but usually simplicity is an offshoot of hard work and results. It seems as if Mr. Trump wants to use simple sounding ideas to get tough results even when good ideas exist that would get solid results in a much less confrontational way. Trump doesn't appear inclined to waiver from his "Make America Great Again" slogan just so he can continue his own pathway of personal simplicity and largesse for his inner circle while the outer circle grimaces in frustration.